Within months after the death of Guglielmo Marconi there were many people and groups that wanted a memorial to be built to the father of wireless telegraphy. In August 1937, Representative Dickstein, (D-N.Y.) introduced a resolution calling for the designation of an appropriate memorial for Marconi. A foundation was created, and in February of 1938, a resolution to permit the Marconi Foundation, Inc., to erect a monument in DC to Marconi, was introduced by Senator Wagner of New York. In April 1938 President Roosevelt signed a bill authorizing a memorial to Marconi. In 1940 the Commission of Fine Arts approved the plans for the Marconi memorial. And the Office of National Capital Parks approved the location at 16th and Lamont Streets in 1941. The memorial cost about $32,555 and was paid for by the Marconi Memorial Foundation. The Foundation was headed by Generoso Pope owner of two Italian-language newspapers in New York who organized the memorial funding through contributions. Marconi was born in Bologna, Italy in 1874 and died in 1937. He took out the first patent on wireless telegraphy based on electric waves in England in 1896. The statue consists of a pair of pedestals on a granite base. 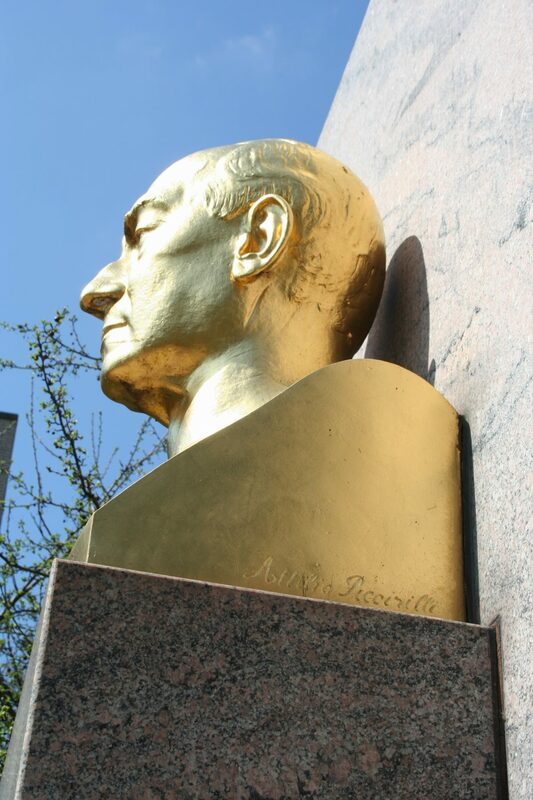 A bronze bust of the inventor, 3 feet 8 inches in height, sits on the smaller pedestal, which is 7 feet high. The memorial is topped with a gilded bronze figure of a woman atop a globe, representing electric waves. The statue is unique in that it is dedicated to a person associated with technology. The memorial was installed at Sixteenth and Lamont Streets NW in July 1941. There was no official dedication, however, a group of 150 members of the Marconi Memorial Foundation inspected the statue on July 22, 1941, and then held a banquet at the Mayflower Hotel.